After FIFA World Cup and inspired by an article published by Estadão newspaper in Brazil, and re-published by Labgis (Geotechnology Center of the State University of Rio de Janeiro, Brazil), we decided to use the same conceptual idea and adapt make this article about the “World Cup of Open Data” and share it with the GIS community worldwide. 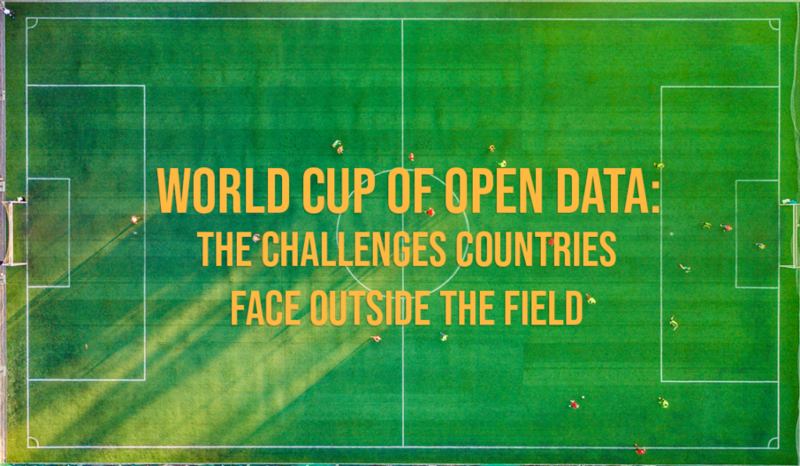 The main idea is to imagine if the World Cup had taken into account the Open Data Index (published by the Open Knowledge Foundation), who would fall along the way and who would be the great champion, beating France in the final phases?. To compare countries, we used the Open Data Index of 2016 developed by OKFN, which aims to evaluate countries in relation to the level of opening of data to citizens, the media and civil society. 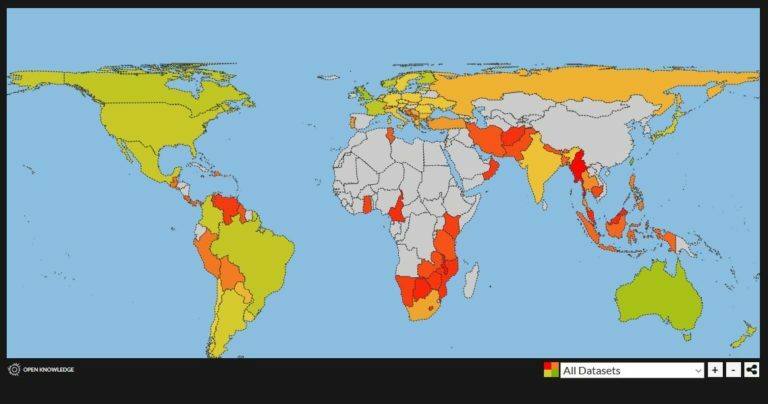 In the index, countries are evaluated in several dimensions, such as public purchases and expenditures, environmental and geographic information, legislative activities, electoral data and socioeconomic statistics. The analysis criteria for each dimension vary from the ease of accessing and working the data, to the analysis of the available format, to completeness and updating of the database. Of the countries participating in the 2018 World Cup, Australia and England (United Kingdom Open Index Index) stand out. Both with a score of 79%, they would make a fierce final, with the England victory being defined in the “penalties”: The two countries tie in eight criteria that compose the index. England stands out in four and Australia is superior in three others. Thus, with decision in the “penalties”, the inventors of football are consecrated the great champion. Taking into account the World Cup brackets, France would fall to England in the semifinals, but would still get an honoured 3rd place, beating Brazil which would have lost to Australia already in the “other semifinal”. Other teams that would get to the quarter finals would be: Denmark, Mexico, Colombia and Japan, which would have taken the 5th to the 8th best places in this World Cup, respectively. The other 8 teams that would have reached the round of 16, but lost their matches in that phase for the other 8 teams mentioned above are: Argentina, Uruguay, Sweden, Belgium, Germany, Poland, Russia and Serbia. Although eliminated in the second round of the Asian Cup qualifiers, Taiwan is the Nº 1 placed in the index, having reached 100% in twelve of the fifteen categories. This positive outcome is due to numerous measures to promote access to and use of open government data, including the launching of a promotional plan to encourage private companies and organizations to make greater use of available datasets, development of a platform open data and the publication of the Government’s Freedom of Information Law Act. Other very well positioned countries in the ranking that were not present at the World Cup 2018 are: Finland, Canada and Norway (all 3 at the 5th place in the ranking with a 69% index level), followed closely by New Zealand with 68%. See the complete ranking here. 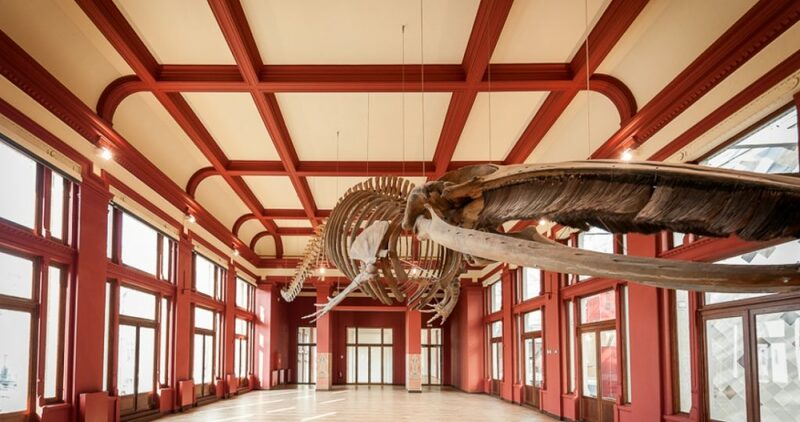 The opening of public data is important for several aspects. The first is to increase the transparency of government actions, such as ensuring identification of the destination of taxes collected from the population. More transparent governments facilitate citizen engagement and this is the second positive effect of data openness. With relevant information accessible, citizens can engage in enforcement and contribution initiatives with the public power. 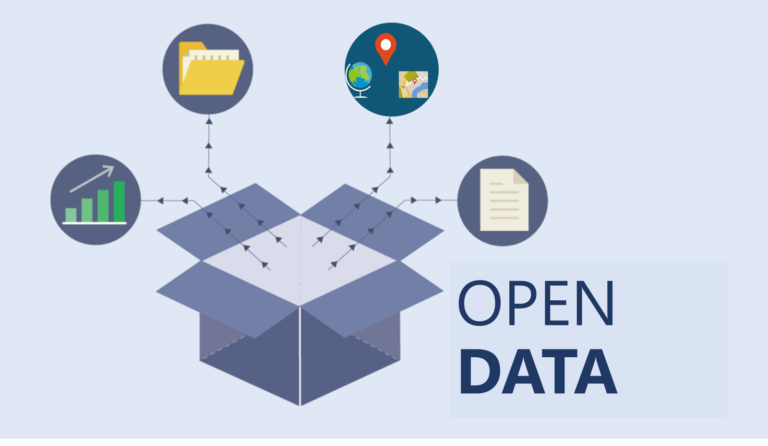 We wrote an article some time ago about the reasons why we monitor open geospatial services, which explains how important the impact of open data is. Finally, the opening of data is important as it allows private initiative to access information to apply and develop solutions to real problems of society. An example of this is some of the transportation applications that uses geolocation, which by accessing open (vehicle fleet) data, are able to estimate the arrival time of these vehicles at their respective stops and the best routes for their users. Here at Spatineo, we help organisations offering and using open data to assure quality and reliability of the spatial services they provide. Did you know that we provide a free tool for anyone to use, to see spatial web service availability all around Europe? That tool is called Spatineo Service Map. Service Map is an optimized tool for checking your country’s service availability in mere seconds. Being easy-to-use and free are also some benefits Spatineo Service Map offers, so why not to take advantage of it? We now see quite a wide adoption of the spatial web services provided by the public sector. Achieving widespread use requires not only good quality data and services, but also that the existence of these services are communicated and advertised to companies and private citizens. Our Service Map promotes openness, which should increase public curiosity and scrutiny of the current service quality. The more users know about your high quality services, the more impactful the quality of the service becomes. What do we mean by that? The more users your service has, the more it has potential to save time of all users combined. If one user saves one minute of their time, once your services have reached standards of high quality, think what kind of impact that quality would have on 10,000 or more users. Once you have opened Spatineo Service Map, you’ll get a overall view of all services we have identified in Europe. At the bottom, you can see the timeline of the number of all known services over time split into the number of high-availability services (99% monthly availabily or more) and the rest of the services. This historic view of the availability data allows you to see Europe-wide and county specific trends in service number. You can also click on a particular month to see the availability statistics for that time on map. You can also dig deeper to region specific data. From this view you can see information on region level. In example Finland is divided into 17 regions and we can see how they compare to each other. 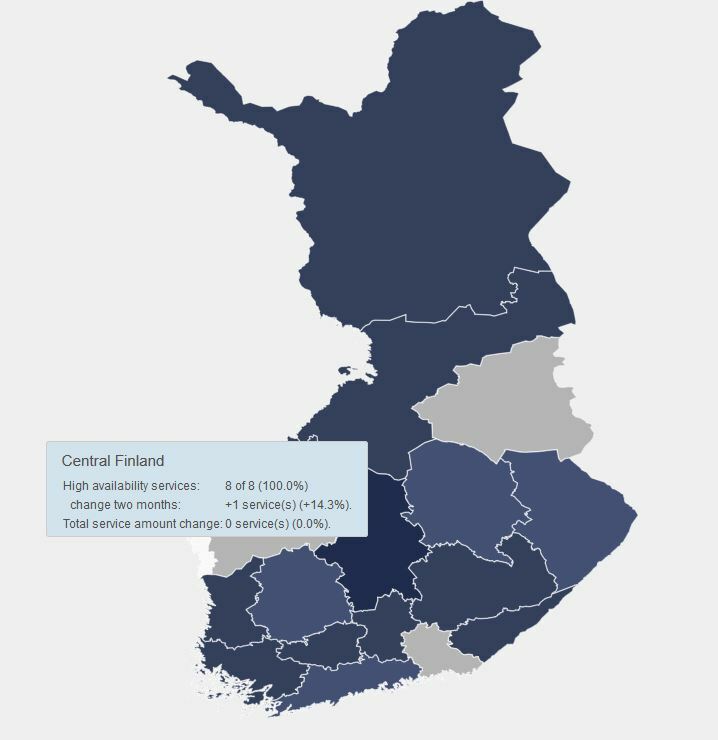 We have identified spatial web services in all but two regions in Finland. On the right side we list the most prominent data provider organisations located in the selected area. More detailed information for each service can be found in our advanced availability monitoring and usage analytics tool Spatineo Monitor, which is available for 14-day free trial. Spatineo harvests available spatial web services from service catalogues and search engines to keep its registry up to date. For the purposes of the map, services are broadly defined as any service endpoint that is described by a single service description document of a particular service type. For example, each WMS Capabilities document describes a single service. All services within our catalogue are continuously monitored. This monitoring procedure is compliant with the INSPIRE normalized testing procedure for availability and has provided us with data spanning back to 2012. 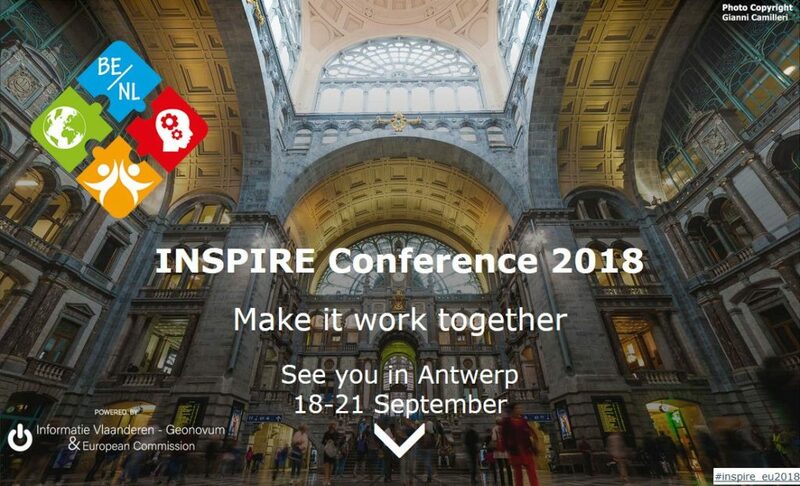 To construct the map, availability results for each service are continuously tested month-by-month against the 99% availability threshold (not counting pre-announced maintenance windows) consistent with INSPIRE requirements. The vision and goal of the INSPIRE legislation is to simultaneously open more data and increase its use. We at Spatineo believe it is crucial to show that organisations are working hard to fulfil their obligations. This transparency is necessary to inspire the private sector to discover and trust the spatial web services that can enable companies to both innovate and build new businesses that utilise the open spatial data. For the actual service quality to improve, data providers should look for tools to monitor and analyse the quality of their services, tools such as Spatineo Monitor. Start Your Free Trial of Spatineo Monitor Now!